Book of Mormon Central / Archive / Study of "The Prophet Lehi"
Title Study of "The Prophet Lehi"
This depiction of Lehi, the first Prophet of the Book of Mormon, is not meant to be a stand-alone portrait. Rather, it is a large study for the work Lehi’s Vision. 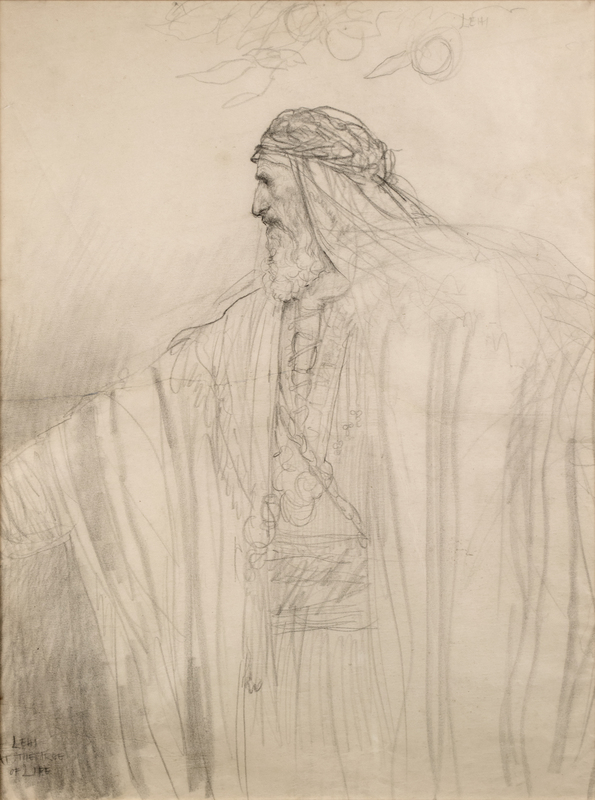 Although Friberg did not ultimately realize a finished painting of the subject, he did several drawings exploring the idea, including a compositional sketch showing Lehi at the base of the Tree of Life, welcoming his family as they advanced along the Iron Rod. Here Lehi stands below the Tree of Life, with a branch and fruit dangling over his left shoulder. He is looking towards Nephi, who is outside of the frame, clinging to the rod with his wife. Lehi has his arms stretched to encourage them.